Half vampire/half angel, Violet, was abandoned amongst the humans in London as a baby. Suddenly discovering monstrous powers on her twenty-first birthday, she thinks she’s the most dangerous creature to prowl the streets. She’s wrong. 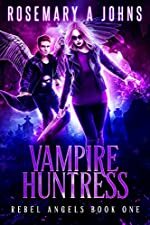 When a snarky angel falls into her lap and her adopted sister disappears, Violet is forced into a new role: Huntress. But the deeper she’s dragged into this supernatural world, the more she struggles to survive.